Growth continued to outperform value as higher interest rates, inflation worries and tough tariff talk from Washington marked the return of market volatility. Simultaneous to the S&P 500 Index entering its first 10% correction since 2016, estimated earnings growth continued to climb higher. FactSet Research commented, “The first quarter of 2018 marked the largest increase in the bottom-up earnings per share estimates for the S&P 500 Index since they began tracking the data the second quarter of 2002.” The bottom-up estimates rose 5.4% beating the previous record increase of 4.8% in the second quarter of 2004. If the estimated growth rate of 17.3% is achieved, it will compare with earnings rates not seen since the first quarter of 2011 of 19.5%. A decrease in corporate tax rates due to the new tax law is a factor in the improving estimates although the full effect won’t be realized until second quarter accounting as employers continue to adjust payroll deductions. Other factors contributing to rising estimates are climbing interest rates which are positively correlated to Financials while higher oil prices boosted Energy estimates. Bond yields increased with the ten-year Treasury peaking at 2.95%, its highest level since January 2014. 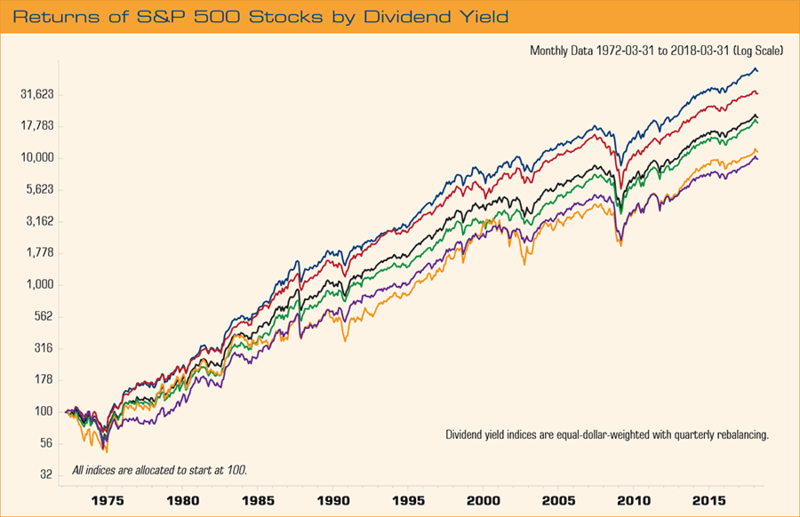 Historically, the top quartile of dividend yielders is negatively correlated to rising rates. The yielders or “bond proxy” stocks are overweight in sectors such as Utilities, Telecom and Staples. Some investors associate outperformance with investing in the highest yielding stocks which historically is not the case. The S&P 500 Index illustration demonstrates the flaws in that assumption by plotting 46 years of total returns based on dividend yields. From March 31, 1972 to March 31, 2018, the highest yielding stocks represented in quartile four rose 13.39% annually, underperforming quartile three which increased 14.40%. Quartile three stocks are also considered to have above average dividend payouts but are not ranked in the top quartile of yielders. Why is this significant? A large portion of dividend “growers,” possessing the strongest fundamentals and dividend payout, are represented in quartile three. As a result, dividend growers have historically provided a superior total return versus the highest yielders. The High Dividend Equity portfolio focuses on companies e believe possess the ability to increase their dividend faster than the rate of inflation versus a fixed income coupon which can be impacted by duration risk. In a rising rate scenario, we feel that owning “growers” is the best way to drive income growth if bond prices enter a bear market. In 2017, dividend increases grew over 7.0%, a pace well below the 2012 rate of 18.2% seen as many companies sought to either reinstate or raise their dividend after the Great Recession of 2008-2010. If the economy continues to improve, we expect higher dividend payouts due to the tax law changes, increased business spending, accelerated earnings and buybacks. For the quarter, the High Dividend Equity portfolio weightings in Information Technology, Utility, and Energy added relative performance while the Real Estate Investment Trusts, Telecom, and Staples sectors detracted from performance. We are currently underweight REITs and Telecom and Utilities. Our top performing companies were Raytheon Corp, Oneok, Inc. and Lukoil PJSC ADR while the weakest included Invesco Ltd, Principal Financial Group and Comcast Corp.
Bloomberg Barclays Capital U.S. Government/Credit Bond Index measures the performance of U.S. dollar denominated U.S. Treasuries, government-related and investment grade U.S. corporate securities that have a remaining maturity of greater than one year. The Russell 1000 Value Index measures the performance of the large-cap value segment of the U.S. equity universe. It includes those Russell 1000 Index companies with lower price-to-book ratios and lower forecasted growth values. The CBOE Volatility Index® (VIX®) is a key measure of market expectations of near-term volatility conveyed by S&P 500 stock index option prices and shows the market’s expectation of 30-day volatility. It is constructed using the implied volatilities of a wide range of S&P 500 index options. This volatility is meant to be forward looking and is calculated from both calls and puts. The VIX is a widely used measure of market risk. The S&P 500 measures the performance of the 500 leading companies in leading industries of the U.S. economy, capturing 75% of U.S. equities. The Bloomberg Barclays Capital U.S. Aggregate Bond Index is a market capitalization-weighted index, meaning the securities in the index are weighted according to the market size of each bond type. Most U.S. traded investment grade bonds are represented. Municipal bonds, and Treasury inflation-protected securities are excluded, due to tax treatment issues. The index includes Treasury securities, government agency bonds, mortgage-backed bonds, corporate bonds, and a small amount of foreign bonds traded in the U.S. The Bloomberg Barclays Capital Aggregate Bond Index is an intermediate term index.